There have been a lot of plant closures announced lately, including several in the food processing sector, which municipalities across Southwestern Ontario promote as one of their strengths. Leamington was particularly hard hit by news that Heinz is shutting down its plant there, where it is both the largest employer and taxpayer. Although there are many places in Ontario that have more people working in the food processing/manufacturing sector, Leamington has—by far— the highest concentration of those workers (NHS 2011) and Heinz was the foundation of the local industry. As the chart shows, while the City of Waterloo scores very well for post-secondary educational achievement, and Guelph and London/Middlesex Centre do okay, as do LaSalle and Tecumseh in the Windsor metro area, the other parts of Southwestern Ontario fall below the provincial average, and in many cases well below. My municipality—Strathroy-Caradoc—just misses the bottom ten (or the top 10, as shown in reverse order above). But even among Southwestern Ontario municipalities, Leamington is at the bottom of the list, which will present some special challenges as the community rebounds from the Heinz closure. When I looked at the National Household Survey numbers a few weeks ago and saw that 47% of the population of the City of Waterloo in the 25-64 age range had a university degree, I tweeted that this was a number that would be hard to beat. You aren't going to find many cities with a population just under 100,000 (using census numbers) and two universities, so it seemed like a number that other communities wouldn't be able to match. It turns out that there are two other towns in Ontario that are right up there with Waterloo. Richmond Hill actually comes out slightly on top using the NHS figures (47.3% vs Waterloo's 46.8%), although I suspect that's within the sampling error. Oakville is also in the top group with 46.1% of its population with university degrees. There's then a noticable drop to Ottawa in fourth place (42.8%). So, Waterloo is at the high end of the scale—and in an elite group—but a group with a couple of other members. The Waterloo ranking is for the City of Waterloo. 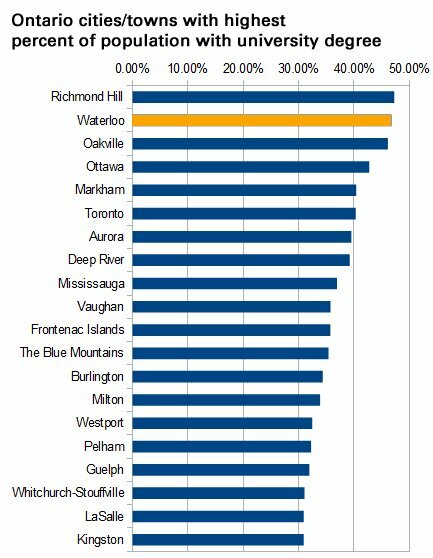 The numbers for Waterloo Region aren't as high, with Kitchener ranking 44th and Cambridge 116th in Ontario. London ranks 29th. After spending the last year focused on helping businesses, FedDev turned its attention back to infrastructure for its new contributions in the period ended March 31. With the rollout of the Community Infrastructure Improvement Fund, there was a ton of activity disclosed in the quarter, with over 100 projects funded in Southwestern Ontario alone. The largest was a $775,224 toward the City of Waterloo's upgrade of Waterloo Park. You can see the full list of funded projects. There were only three new disclosed repayable contributions for Southwestern Ontario businesses in the quarter. First, there was the $542,399 in Investing in Business Innovation funding for Kitchener's TribeHR that was announced not long after it happened (still a rarity with government funding of all kinds). The other two were large contributions under FedDev's Prosperity Initiative—$2.5 million to Woodstock's NASG Canada (North American Stamping Group) and another $2.5 million for a company in Brantford listed as 1818155 Ontario Inc. (a Google search only turned up sketchy details and no operating name). And that was it for the quarter. Across the province, the largest new contribution was $2.7 million for the Ontario Chamber of Commerce, also through the Prosperity Initiative program. That funding was announced a couple of weeks ago. FedDev has disclosed its contributions for the period ended December 31 and it was a strong quarter for Southwestern Ontario, which accounted for five of the top seven new fundings. The largest contribution in the province was the $13.7 million for Western University to go toward the Fraunhofer Project Centre and a new centre for commercialization of advanced manufacturing technology. That funding, under FedDev's Prosperity Initiative, was announced in November. The third largest contribution was announced last week: Communitech receiving $6.4 million under the Technology Development Program to go toward the development of two new satellites. Cambridge's exactEarth is receiving a $2.5 million repayable contribution for a related project (last week's news release has the details). The $3.1 million repayable contribution to Lambton Conveyor to help it set up a new facility in the Wallaceburg area of Chatham-Kent was announced in December. That was also under the Prosperity Initiative. The other big contribution in Southwestern Ontario in the quarter was $945,000 given to the Accelerator Centre in November as part of FedDev's Scientists and Engineers in Business program, which helps STEM grads and grad students launch startups. Under the same program, Mississauga's RIC Centre received an additional $2.5 million in the quarter, which is on top of the $5 million it was given just over a year ago. The RIC Centre has worked with startups in Waterloo Region and across Ontario through its VentureStart program, and Waterloo's Canadian Innovation Centre has also been involved in the delivery of that FedDev-funded program. Also falling under the Scientists and Engineers in Business program was an additional $500,000 in the quarter for OCE. It was originally allocated up to $1.1 million a year ago. Under FedDev's Applied Research and Commercialization program, which provides funding to universities and colleges to do research-related work on behalf of companies, the University of Windsor saw its funding bumped by $250,000 in the quarter, which means that its total funding under the program ($1.5 million) is now on par with that provided to UW, Conestoga College, and University of Guelph (which received an additional $50,000 in the quarter)—and well above that received by Western University. That's particularly impressive given that Western initially received 55% more funding than Windsor, but while Western had the biggest drop between initial and extended funding among all ARC-funded universities in Ontario, Windsor clearly made the program work and had the biggest gain. The $216,842 received by Laurier in the quarter was under FedDev's Graduate Enterprise Internship program, which helps companies hire recent STEM graduates. There was some rejigging of the amounts allocated under that program in the quarter, with the Research Park in London (-6.2%) and the University of Waterloo (-9.5%) both showing small reductions to their funding, but with the new money provided to Laurier. Bolton-based PerspecSys ($742,500) and Toronto's TopHatMonocle ($750,000), which both have Waterloo connections, received funding under FedDev's Investing in Business Innovation program, which partially matches angel group/VC investment in companies. The same program provides funding to angel groups, and London's SWOAG got its $100,000 during the quarter. It's municipal budget season again, which brings a slew of reports and presentations related to short-term and long-term funding needs. Earlier this week, Chatham-Kent council received a consultant's report comparing population densities among various Ontario municipalities. Population density can be a significant factor in municipal expenses and tax rates as low-density areas have to figure out how to provide services to a population spread out over a wider area. The report showed Chatham-Kent at the bottom end of the density chart, completely dwarfed by every other municipality shown. I expect Chatham-Kent to have a low density, but having spent the last couple of years living and working in low-density areas, it wasn't clear to me that it was really that much of an outlier. It turns out that it isn't. 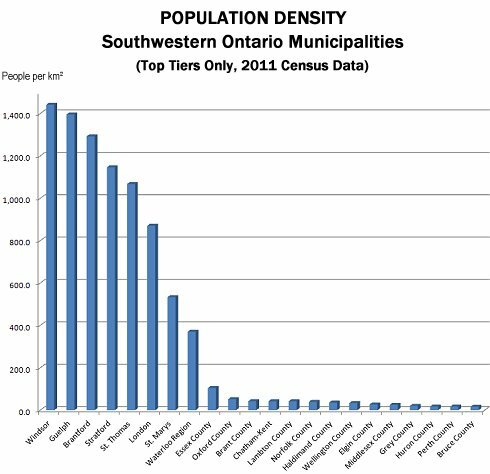 When you look at population density figures for all top-tier municipalities in Southwestern Ontario, Chatham-Kent's is comparable to that of surrounding small urban and rural areas (and higher than Middlesex County, where I live, although I live in a denser-than-average part). Whatever challenges come from low density, there are a lot of us in Southwestern Ontario in the same boat. Obviously, cities are more dense, but the graph really shows the urban/rural divide. 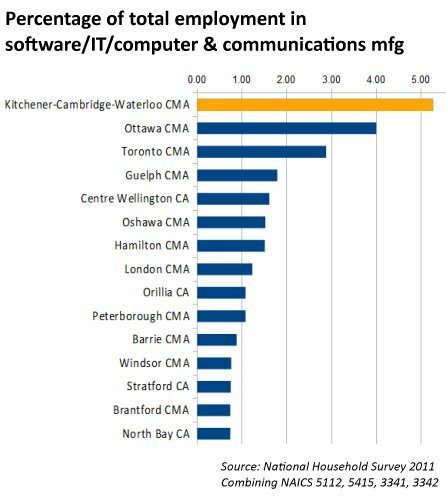 The cities of Kitchener and Waterloo aren't on the graph, since they're part of Waterloo Region. If they were, they'd take the top two spots. The City of Waterloo is hardly the densest place in the world, but it still has more than 35 times as many people per square kilometre as Chatham-Kent and more than 60 times as many as Middlesex County. Low density is another of the challenges faced by small urban and rural Ontario that I hadn't been accustomed to, coming from Toronto and Waterloo. Although, having said that, looking at the graph it seems pretty clear that the magnitude of the challenge doesn't correlate (inversely) with the height of the bars.